Wally makes fast, streamlined, stylish sailing machines which are ideal for charter. The Wally 77 Carrera is no different and she makes and excellent stylish sailing charter yacht. The Wally 77 Carrera has two different draft settings, to provide very good sailing performance. Her keel is the usual Wally lead bulb, attached to the stainless steel fin, which can be hydraulically raised, making it possible to have a 2.50 m (8’2") draft - ideal for entering shallow waters and getting nice and close to the shore. 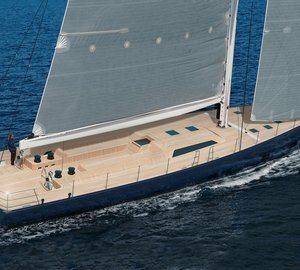 She can also drop her draft down to 4.05 m (13’1") for stable performance sailing. The Wally Carrera can easily be sailed by just the helmsman alone - due to her powerful hydraulic remote-controlled sail-trimming system as provided on all Wally Yachts, built since 1995. Carrera combines her beautiful lines with a striking blue color creating a stylish and elegant yacht which turns heads – especially when she is under sail. Her track on the self-tacking jib is recessed which leaves her deck safe, clean and uncluttered. Like most other Wally sailing yachts her deck layout of Carrera includes two separated areas. There is a maneuvering area which is positioned aft of the charter guest social area which is amidships. Carrera’s salon provides ample natural light which filters down through her well designed hatches and windows. Her saloon provides a clean sophisticated atmosphere with it modern design and natural teak finishing. The Wally 77 Carrera comfortably accommodates up to 6 charter guests plus and 2 crew member. Her main owner's stateroom is located forward and features a full-width queen size bed and en-suite head and shower. Her guest cabin, on the port side, is fitted out with a queen size bed and an en-suite. Another third guest cabin, on the starboard side, provides a further two beds as well as an en-suite and shower. Wally 77 Carrera’s main saloon offers a dinning table and seating for 8-10 charter guests. The Mediterranean Wally 77 Carrera offers charterers the following extras and amenities: a Nova Marine (6 person) tender, with, 12 hp out board engine, a reverse osmosis water maker, a Sony hi-fi music system and a Phillips TV and VCR.